On World Water Day, Weedward and Bongstein score an exclusive interview with river-turned-living-entity Ganga Maa. n an unexpected turn of events, the Uttarakhand high court has declared River Ganga, the cradle of our civilisation, India’s first living entity. Being intrepid reporters and India’s foremost investigative journalists Weedward and Bongstein were the first interviewers on the scene. W&B: So how does it feel to finally be recognised as a person? Ganga: Frankly, nothing has changed. I am and will always be Ganga Maiyya. Only, henceforth, if someone throws trash at me, I can probably file a police complaint and rant about it on Facebook. W&B: So rivers are big on social media? Ganga: Definitely. I post the occasional selfie, but someone’s always photobombing it with a coconut or something. Also it’s hard to make real friends when people keep dumping leftover puris and bodies near you. I’m afraid people might start questioning my personal hygiene. W&B: So are you on Tinder too? Ganga: A real woman never kisses and tells. W&B: How do you keep in touch with your friends, Cauvery and Tapi? Ganga: Oh, C&T? I check out their Instagram handles every once in a while, post things on their wall for a bit of a laugh. I have so many more followers than them… it’s actually ridiculous. You know how many white people follow me? Plus, Cauvery gets a lot of heat because she isn’t that much into sharing, you know. I’m great that way. W&B: It must be hard to be revered by so many people. How do you cope? Ganga: Well to be honest, I’m running dry trying to handle them. I haven’t had a proper shower in thousands of years. But they keep coming back to me to bathe their cattle. I can’t support them anymore. 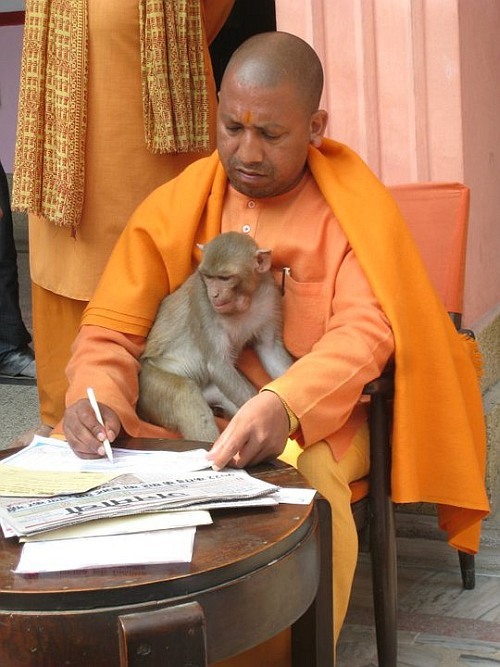 W&B: What do you think of Yogi Adityanath? Ganga: Well, as a river, I usually refrain from taking a stance on issues of such nature. But since you ask, I must admit, I saw Instagram posts of the new CM chilling with a monkey and a dog, and found them so aww-worthy. W&B: You really need to do a little more research. Anyway… you’ve been here forever, ever thought of taking a vacation? Ganga: I’m tired of just going with the flow. I’d really like to take a vacation. But how? It’s not like I can simply pack my banks and leave for the beach? If I leave where will you go white water rafting? Who’ll water your fields? Who’ll supply you with my world famous Gangaajal? Have you tried some of it? W&B: Um… you do know Gangaajal is for people about to die, don’t you? Ganga: What? Why? Just dead people? I’m sick of dead people! I can’t be all that bad. I heard someone named Prakash Jha even made a documentary about it. On hearing that a nobody named Gracy Singh had starred in Gangaajal and River Ganga got absolutely no footage, she became turbulent with anger and started rocking W&B’s boat. Concerned for their safety, W&B decided to end the interview and head for safer shores. Being in UP, a safer shore was out of the question, so they decided to head upstream to Rishikesh and have been MIA since.